After we uploaded Premanand’s writing on the 'miracle' at Kamarali Durvesh Dargha, Shivapuri, Pune, we came across a very interesting article on the same ‘miracle’. It was published in Skeptical Inquirer in its Spring/Summer 1978 issue (Volume II, No.2). Since this article is not easy to come by, we post it here for the benefit of our readers. When Philip Morrison, the book editor of Scientific American magazine, heard about a remarkable demonstration that was said to take place in a temple courtyard near a small town in India, he was curious enough to ask questions of a firm of scientists and engineers located in Bombay. Their director, Mr. R.C.Globe, was familiar with the phenomenon, and replied fully to Morrison's inquiry. I thank you for your letter....with reference to the stone lifting at Shivpuri. As requested, herewith details of this supposed and mysterious power which it is said and believed lifts the stone ball. I give some of the details which you may find interesting. The mausoleum contains the body of a saint, a Muslim named "Kamarali Darvesh" who died about 700 years ago. 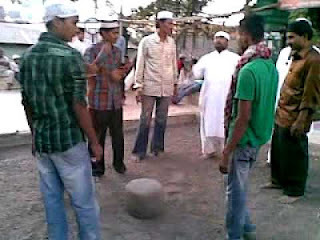 There is always a Muslim in attendance to satisfy the curiosity of visitors to witness the "unaccountable and mysterious" lifting of a round stone ball which stands the larger of two on the ground adjacent to the entrance of the "Durgah," the Urdu name for the word "mausoleum." This ball of basalt (or sand-stone, which is lighter)is about 14 inches in diameter and thus weighs about 140 pounds. Visitors must not attempt to influence the "spirit" which is said to lift it unless there is an odd number of men, i.e., 5, 7, or 11, no women being allowed to join the solemn(?) proceedings. The men gathered round the ball are then instructed by the attendant to touch the ball with one finger and when he gives the signal by voice, the men must shout in a loud voice in unison, the name of the saint, i.e., "KAMARALI DARVESH," but in a drawling tone of voice, when the stone will lift of its own accord; mark you, with the forefinger of each man still touching it. The mausoleum is outside a small village, Shivpuri, about 16 miles from Poona, in the State of Maharashtra, Western India. I visited the place purposely to see this lifting by a mysterious power which is attributed to a divine entity, but failed to connect it with the "spirit" of the dead saint. By mathematical calculation the stone weighs about 140 pounds so that 9 men pushing with one finger exert a force of about 15.5 pounds each, sufficient to lift the stone without any exertion or apparent effort. This of course is not believed by any Indian; they insist that it is the Unknown Power which does the lifting. No amount of discussion will move this belief out of their minds. I don't believe that the joining up of ectoplasm supplied by each member of the group is responsible for lifting up of the stone ball. To add to Mr.Globe's account may seem superfluous, but some interesting physical facts should be made clear. 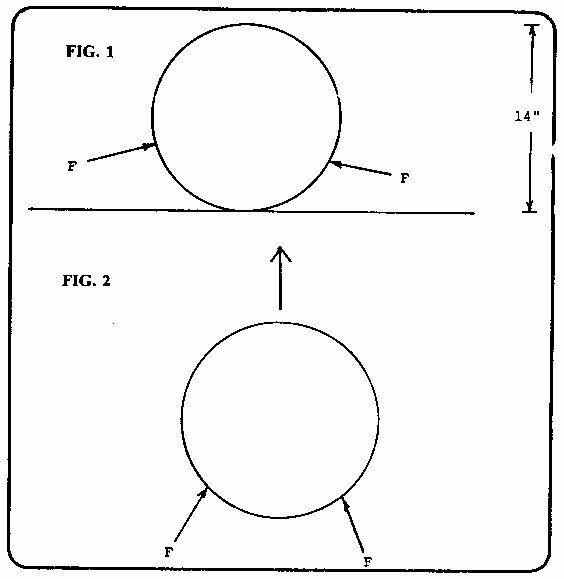 When the ball is resting on the ground, any force applied as shown (F) will tend to make it roll, unless exactly countered by an opposite and equal force. With a number of persons crowded about the ball, such equal pressure all around seems unlikely. Therefore, the ball will tend to roll in one direction or another. Now it is not clear from the account given just what instructions are provided by the attendant present to supervise the miracle. If he gives the men reason to believe that their forefingers must maintain firm contact with the ball, conditions for it to begin rolling are optimum. There is no doubt in the minds of the faithful at this manifestation that the ball is now moving by divine force. To keep in touch with the ball is now more difficult, and each pushes harder, so that the small push necessary is delivered readily, and up goes the ball. 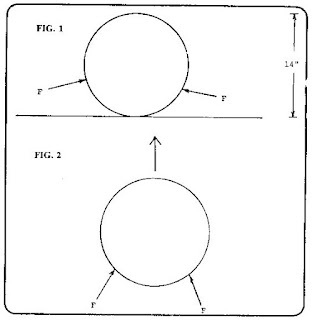 As the ball rises, the angle at which each person applies pressure will change, and the ball should accelerate, since the individual pressures are resolved into a much more direct upward push. I request you to pls don't interfere in the religious mater as it concern. You pls mind you own religion & research on that because people like you create the distinguish & make people to fight each other. Where who is he, what you want to do? people believe him & his miracle. Still you carry the same the the my reply will be in worst language. Politely i'm suggesting to be out of this. Please dont say that. If you believe in all these , its your choice. Please dont force anybody to belive in anything . there is a very thin line between believing or followig something stupidly.. Your lack of respect for independent thought and communication is appalling, you are what is wrong with the world, and if Muslims are like you, then no wonder they bring the worst on others. Anyone can criticise or even insult a religion or believe, don't like it? forget how to read, shut your wyes, your ears or walk away, that is your right, but do't you dare demand respect of a belief when you can't even resect the basic right freedom of man.